Whether she’s in Jordan or Baltimore, UMBC’s Maheen Haq brings a deep sense of duty to her work with communities facing discrimination. Now, Haq ‘20, global studies and economics, a Sondheim Public Affairs Scholar, has been named a Newman Civic Fellow in recognition of her work. Haq follows in the footsteps of public service-minded Retrievers who have earned the Newman Civic Fellowship across the nine-year history of the Campus Compact program. They include Stephanie Milani ‘19, computer science and psychology; Sophia Lopresti ‘17, global studies; Maxwell Poole ‘18, computer science; economics; and Kelly Cyr ‘12, biological sciences, and M.S. ’13, applied molecular biology. With support from the Shriver Center, Haq has engaged with local organizations that work to help communities negatively impacted by social and political issues. As a volunteer at the Esperanza Center, she helped teach English to recent immigrants. She has organized clothing and food drives and distributions for people facing homelessness in Baltimore City. Haq has also been able to work with youth managing social and economic challenges and helped organize protests around issues she cares deeply about, combating hate speech, racism, Islamophobia, and fighting for the rights of immigrants. Internationally, she’s participated in relief efforts for Syrian refugees in Jordan, working closely with UMBC’s study abroad office to connect with local service organizations. She’s also supported women who are survivors of violence in Pakistan. 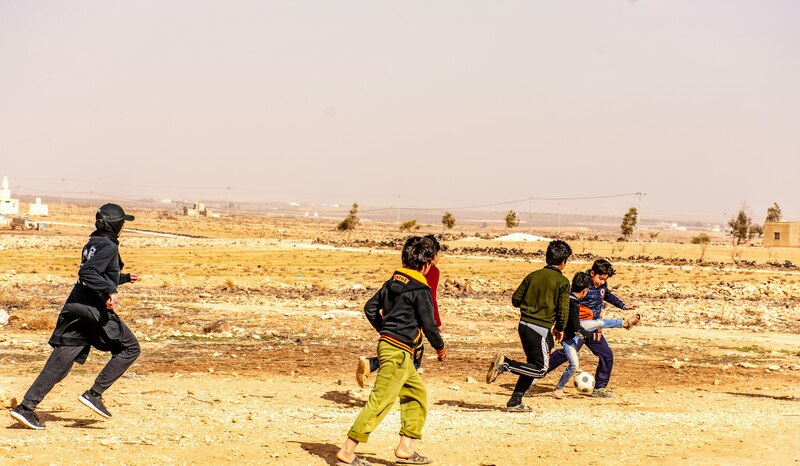 Maheen playing soccer with Syrian children in a Jordanian refugee camp after passing out soccer jerseys she helped fundraise for. “Because I experienced discrimination growing up, it has opened my eyes to the experiences of other communities who face discrimination,” says Haq. As a student at Smithsburg High School in Hagerstown, this awareness flourished. Haq served as president of the International Awareness Club, Spread the Love Club and the CoExist Club to support students facing any type of discrimination. She also traveled to Pakistan to help with Depilex Smileagain Foundation, a Pakistani organization that helps women who are survivors of acid attacks and ostracization with medical support and workforce development skills. Maheen posing with boys from a Syrian refugee camp after handing out soccer jerseys she helped to fundraise. Recently, Haq advocated against exclusion and prejudice through op-eds in the Baltimore Sun. Her first piece focused on her experience living as a Muslim in the United States, and her faith that the Declaration of Independence’s promise of freedom for all will be fulfilled. Her second piece, written as a letter to the Hagerstown’s mayor, reflects on Islamophobia she experienced growing up in the town. Haq followed her op-eds by helping to organize a community town hall and a rally against hate speech. Maheen playing with a girl from a Syrian refugee camp. Haq has used her time at UMBC to develop research skills and a greater understanding of global issues. Through a course on globalization with Felipe Filomeno, assistant professor of political science and global studies, she developed a research study to better understand the role of faith in helping refugees cope with the challenges of daily life. 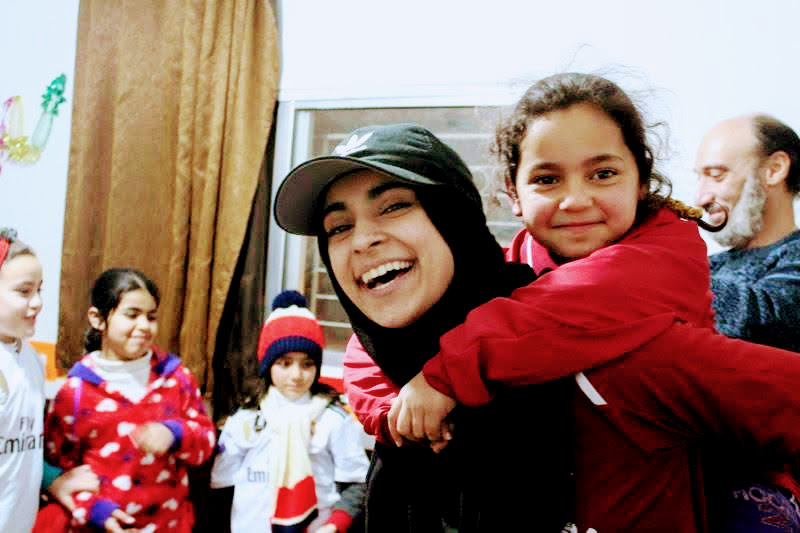 Haq traveled to Jordan to conduct her study, working with Helping Hand for Relief and Development, an organization that provides services to Syrian refugees. 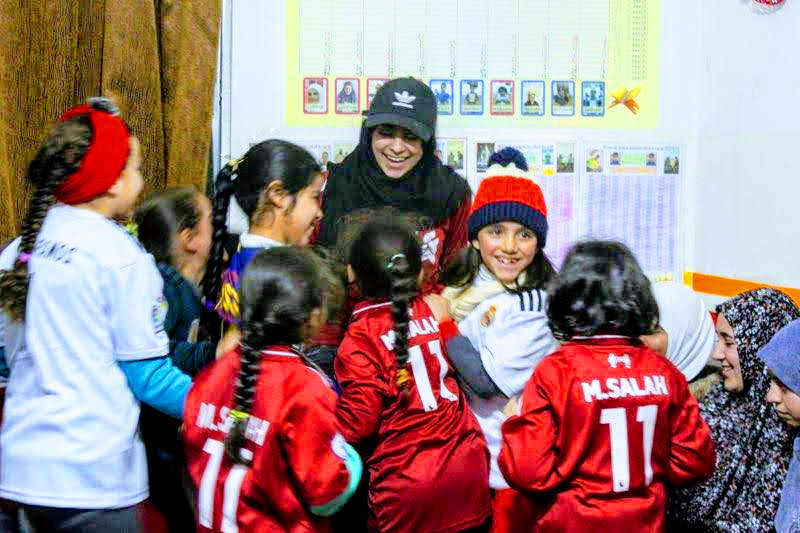 Maheen getting hugged by a group of girls from a Syrian refugee camp after she handed out soccer shirts to each of them. Through qualitative interviews, I found that the majority of refugees did not leave their faith, but drew strength from it to manage daily survival,” shares Haq. She hopes to use her findings to develop literature to enhance the way aid is provided to the refugee community. 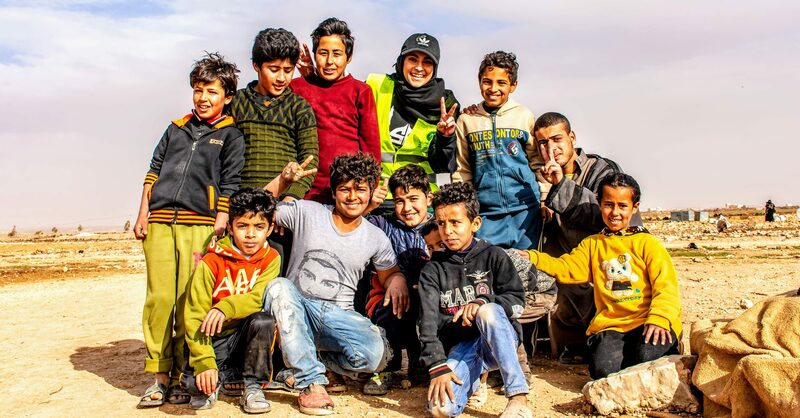 Banner image: Maheen giving out toys to children in a Syrian refugee camp. All photos courtesy of Maheen Haq with permission from Helping Hand for Relief and Development.